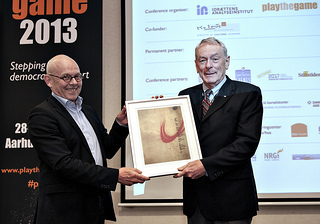 Former IOC vice president and WADA president, Richard W. Pound, was on Monday evening presented with the Play the Game 2013-award. In his speach, Soeren Riiskjaer, vice chairman of the board, stated that change in international sport is not made because journalists, whistleblowers and organisations like Play the Game make lots of noise from the outside. ”Change must come from the inside where you have to be diplomatic, discreet and very low-key. But it is sometimes difficult to find leaders on the inside of sport who are really committed to go to the root of problems”, Mr. Riiskjaer said. The vice chairman pointed out that there is at least one courageous insider who proves, he can achieve a lot, even if he is often anything but discreet, diplomatic and low-key. ”And we are definitely not talking about a Mr. Nobody in the international sports movement,” Mr. Riiskjaer added. Before asking Mr. Pound on stage, Soren Riiskjaer called the former IOC vice president’s methods both ruthless and direct when it comes to pointing his fingers at the all too many sore points in the international fight against doping. In 2011 Jens Weinreich and Andrew Jennings received the Play the Game Award. The award has been given six times since 2002.